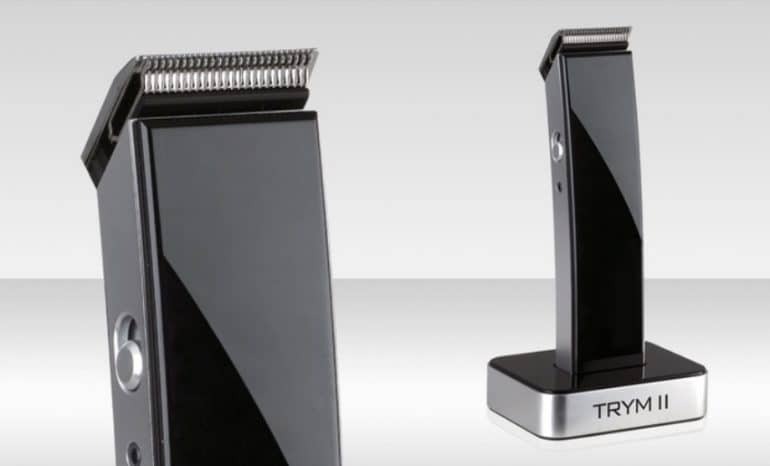 The Trym II reviews (also known as Hangsun Trimmer) in this post will show you why this little known hair clipper is fast becoming one of the most popular model on the market. You can’t take any chances when it comes to your looks and the TRYM II – The Rechargeable Modern Hair Clipper Kit does not take any chances when it comes to design. The lines are smooth and straight and this thing looks like it stepped out of time machine. It really stands out and looks fantastic in my bathroom. This clipper is a mid-priced yet high quality machine that can be used for facial and body hair. The TRYM II, as the name implies, is an improved version of its predecessor, and we must say immensely improved. This second version comes with a number of top end features which makes the TRYM II a contender for best performing clipper, but let’s not get ahead of ourselves. We review the TRYM II in full below, but first, let’s take a look at the product info box. This Clipper falls under the Pure Enrichment brand of products which are aimed to enhance everyday life, and the TRYMII does not fall short of the company’s meticulously crafted products which meet the highest design & quality standards. The tactile buttons start my day off right with a convincing switch on and the unit feels great in my hands as it is very light and easily manoeuvrable. My last hair clipper would pull out the occasional hair which left me wincing and waiting for pain. Not anymore. The TRYM II – The Rechargeable Modern Hair Clipper Kit massages your face delicately and politely while it trims. The adaptive heads of the trimmer came in a few different lengths as is standard with trimmers these days. I tried the shortest one to trim my beard and get that snazzy Brat Pitt look that Angelina can’t say no to. The cordless feature is a benefit in itself yet the fact that it is equipped with a super charge battery means that it gets fully charged within an 1 hour and enables you to use if for long periods on one charge. You also have 2 options for charging the TRYMII, either through the handy charging dock or else via an AC adaptor inserted at the bottom. Now that’s convenient. The blades are made from Professional-Grade Ultra-Sharp Compound Metal which are engineered for the finest cutting experience. You basically avoid any pulling and tugging which can sometimes be felt with other competing products and instead get smoot professional looking cuts. The 4 attachments that come with the trimmer range in length, from 9mm at the highest end to 1.5mm and therefore cater for various types of hair lengths and styles. This makes it possible to use also for facial hair trimming like mustache, goatee, beard, and also to trim the body hair. The design of this clipper must be the most elegant there is on the market. Leave the unit on the docking station when not in used and you have a unique piece to complement a modern designed bathroom. The TYRMII is extremely lightweight and compacted which makes it easy to use and stress free on the hand especially in those days dedicated to your grooming needs when you spend long periods trimming all round your body. For all it’s features, this trimmer is definitely great value for money since it is in the mid-price range of barber clippers. In order to keep the blades in top working order the clipper blades must be cleaned after every shave. Some of the parts are made up of plastic which looks a bit flimsy and may therefore break after extended use. 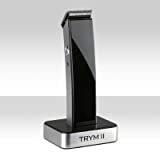 The TRYM II review above shows that this hair cutting machine is an easy-to-use, ergonomically designed trimmer that can cater for your complete needs including facial hair and body hair. It feels extremely easy on the hair and skin and will give you a smooth, clean cut without any irritation.